Straker is on an inspection tour of Moonbase when UFOs are sighted. Captain Sayers leads an Interceptor flight but the UFOs are able to plant some sort of limpet device on SID before being destroyed. This jams all communications with an ear-splitting sound, and Moonbase is effectively blinded. Sayers volunteers to take an Interceptor and try and deactivate the device but the pilot is really a traitor in league with the Aliens. A massive UFO fleet is massed near Mars and is ready to attack. Seemingly successful in dealing with the device, Sayers returns to Moonbase and attempts to start up the system but he is overpowered. Straker suspected something, and Sayers is found to be wearing ear plugs which protected him – had he started up the system again, the jamming signal would have blown all communications. A back-up mission deactivates the device, and the Alien fleet is destroyed. A UFO is destroyed near the Moon by Interceptor One, but jettisons small metal canisters which Interceptors Two and Three cannot hit, even with computer-guided missiles. Moonbase warns Earth, but even Sky One cannot destroy them all. Straker decides to deal with them on the ground, so Alec Freeman and new recruit Hoyle are despatched as the nearest operatives. The canisters seem harmless but when Hoyle impulsively approaches one, he is struck down by gas. Masking his face, Freeman pulls him clear, but Hoyle then turns violent. Knocking him out, Freeman realises if any canisters landed in a town, there would be terrible riots. With no time to waste, Straker parachutes from a SHADO jet to join Freeman, and investigate another nearby landing. This is in the private grounds of the Duke of Brandon but inside, Straker and Freeman have to contend with game animals driven wild by the gas. Climbing a tree to avoid angry cattle, they are saved by a recovered Hoyle, who drives the car under the tree. The mention of shotguns by Freeman gives Straker an idea to counter other landings by canisters. Modified missiles which break up into smaller individual shells are used – just like pellets from a shotgun – and for now, SHADO has won again. In the Pacific Ocean, Skydiver is alerted to a UFO estimated to arrive in their area. Captain Carlin launches Sky One but as he approaches the UFO, his missile launching system fails and he has to use cannon fire. The UFO also fires, and Carlin is forced to ditch in the sea. With communications also out, Carlin is amazed to see an old warship nearby, and swims over in the hope of finding a working radio. As a SHADAir rescue plane is ordered to search for Carlin, the captain finds the warship deserted except for dummies – and the Alien of the crashed UFO in the radio room. Carlin is now a prisoner, and the Alien has undoubtedly called for help. Carlin tries to fight the Alien, but the spacesuit is like armour and the captain comes off worse. Forty miles away, the World Navy are launching their new ‘Barracuda’ tactical nuclear torpedo – at the target warship! As the SHADAir plane, carrying Paul Foster, enters the strike area, it is warned off. Foster takes his chances, and spots the unconscious Carlin on the deck of the warship. But as he tries to get a stunned Carlin clear, the Alien re-appears and shoots down their ladder. With time against them, Carlin and Foster dive over the side, back to Sky One, and take it underwater as the missile destroys the warship, Alien, and arriving UFOs. 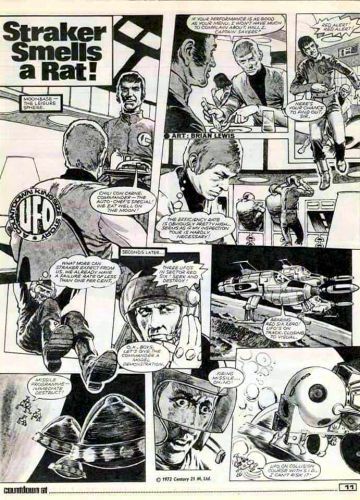 A UFO penetrates SHADO defences, and lands under the cover of a heavy storm in London. As Paul Foster is despatched in a Mobile to search for it, the Alien takes cover in a seemingly deserted rain-drenched building, and mutual terror strikes as it faces a caged tiger. Alerted by the noise, a zoo-keeper investigates and, in a short fight, is killed. The Alien’s face-plate is smashed, and it seeks liquid to survive. In the morning, the other zoo wardens find their colleague’s body – and the landed UFO. Foster is diverted to London Zoo, and is shown the Alien’s smashed helmet. Realising the Alien requires liquid, Foster heads for the aquarium, and find the Alien unconscious in one of the tanks. The whole tank is transported across London to a nearby hospital, where the Alien is fitted with a rigged up helmet filled with a special solution. As SHADO operatives guard the exits, the Alien recovers and kills an orderly. Stealing clothes and a van from the hospital laundry, the Alien escapes back to the zoo. Releasing the big cats as a diversion for the SHADO guards, the Alien heads for the UFO. But a leopard leaps at the Alien, and sets off the UFO’s self-destruct mechanism, killing him.